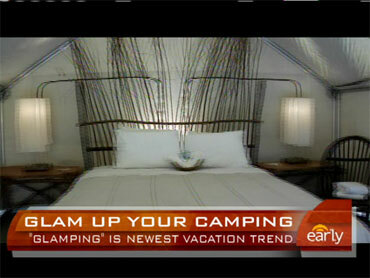 A Step Up from Camping -- Go "Glamping"! If you like the idea of camping out, but you're not sure you're ready to rough it in the outdoors, you could try glamorous camping -- or glamping! The destinations enable you to get back to nature and stay in tents, while enjoying a few modern amenities. And, most glamping options are affordable -- an added bonus! On "The Early Show" Friday, Travel+ Leisure magazine Associate Editor Sarah Kantrowitz filled viewers in on that newest trend in vacationing. "If you don't want to rough it, but you're looking for something more rustic than a hotel, then glamping is for you," she told co-anchor Harry Smith. Glamping is, she says, kind of a middle ground. People were talking about glamping a few years ago, but it's picking up steam now, particularly in places where the weather is ideal for camping and glamping experiences. • Guests stay in cedar cabins and safari tents grouped in villages with names like "Peace Tree" and "Shaded Creek"
• Saturday evenings, May through October, guests and neighbors gather at the Creekside Green for a night of blues, jazz and bluegrass. • River Camp, the newest tented accommodations, boasts six tents that line the Blackfoot River. The safari-style accommodations are outfitted with electricity, feather beds, western chic furniture, private decks, and even their own personal butler. • Outdoor adventures include fly-fishing, tubing, kayaking, rock repelling, whitewater rafting, bird and wildlife watching, and sporting clays shooting. • An eco-adventure resort where our guests can retreat from the chaos of everyday life. • Surrounded by undisturbed wilderness, rolling coastal hills, secluded beaches, and connected to four state parks, 30,000 acres of hiking trails. • Set on a 50-acre organic farm in the Southern half of Idaho's panhandle, outside the university town of Mosow, Idaho. • There's a B&B and a farm school founded by MaryJane Butters. Her slogan is "farmgirl is a condition of the heart"
• Five private canvas-wall tents, each with an own outdoor bathtub and kitchens, vintage iron beds, organic-cotton sheets. No electricity (just battery-operated lanterns). There's also a smokehouse, greenhouse, chicken coop, library, and a pond. • On the Osa Peninsula, in the Southern Pacific region of Costa Rica. Fly on one of the daily flights from San Jose to Drake Bay, then there's a 10-minute boat ride to the Corcovado area. • Tent Camp is located right on the beaches of Las Caletas. There is a fresh water lagoon, the ocean, and the jungle all in one place. • Travelers sleep in comfortable, full-size tents with wood-frame beds. • Kayaks, snorkeling gear, surf boards, canoes, boogie boards, fishing gear and three full meals are included in the price.